If news of the Lumia 920 selling out in China, but then being withheld due to incorrect pricing, wasn't enough then we've also got word that both Telstra and Clove have both sold out in the first day of going live. It appears (depending on how many units were stocked in the first batch) demand is high for the handsets - even at full / the correct price. The Australian carrier opened up pre-orders earlier today with a variety of colours available on plans starting from $65 a month. With a launch date sitting at the end of the month - November 29th - we were expecting a number of orders to go through with the high level of interest displayed through the registration period. 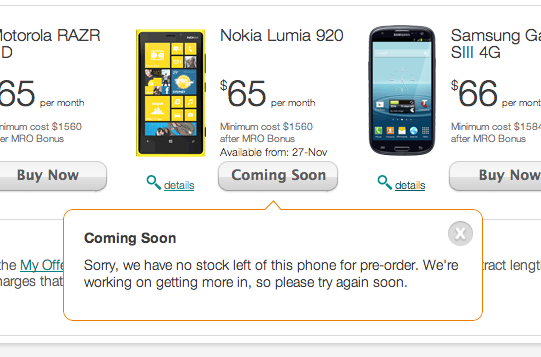 It seems as though this is the case with each colour of the Lumia 920 being sold out in no time at all. Telstra had a trick up their sleeve to further incentivise consumers in choosing the Lumia 920 with the carrier by offering a free portable JBL Playup speaker (valued at $199) with any order placed before November 26th. There's no word on when more stock will be available and pre-orders opened up again. UK retailer Clove announced today as the day of availability for the Lumia 920 and when the company would start shipping orders, so (as one can imagine) everyone jumped on-board. It's a strong position Clove (and other supporting retailers) find themselves in as EE currently holds exclusivity on the Lumia 920 (thanks, Nokia!). "WHITE STOCK - SOLD OUT. Any order already placed will be shipped from the first batch of stock. Other colours to be confirmed." It's looking like a strong start for Windows Phone and Nokia. Shall we toast to the momentum building and continuing with further announcements? 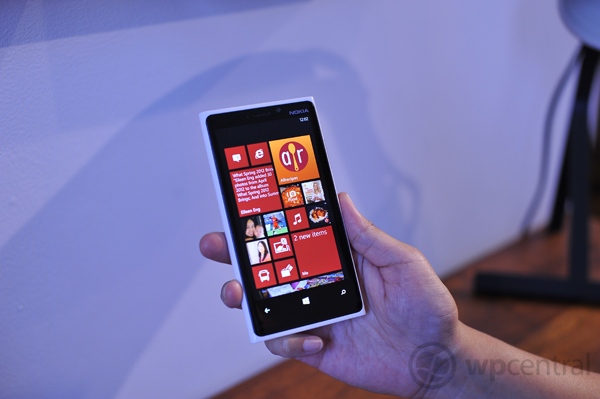 Source: Telstra (Lumia 920), Clove; thanks to everyone who tipped us!